Orbital systems is a one stop solution for both Rotary Index table type & Linear Assembly Lines. We have manufactured complete Assembly Lines for products like Latch, Wiper, Window Regulator, Car Seat Track, Parking Brake Cable, Shifter Cable, Piston Rod, Shock Absorber, Suspension Valve, Car Seat Track, MCB, Capacitor, etc. 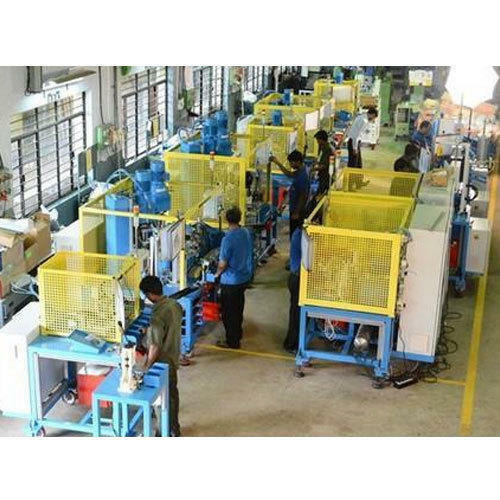 We integrate automatic part feeding, presses, riveting, screwing, welding, crimping, testing, heat staking, punching, drilling, tapping, etc in these machines. Established in the year 1985 at Nashik, Maharashtra, India, we “Orbital Systems (Bombay) Pvt. Ltd.,” are one of the leading names in the field of manufacturing and supplying of Rotary Index Tables, Cam Index Drives and CNC Rotary Tables. The offered systems are backed by latest technology so as to ensure in them optimum functionality support in given applications. We are an ISO 9001: 2008 certified company, with business operations led by experienced management that guides the team in involved operation stages and takes them towards delivering the best of their capabilities. Further, the dedicated and consistent approach shown by our team also allows us to flawlessly handle the involved business operations so as to deliver end solutions as per the expectations of our customers. Today, our consistent business approach has helped us to establish our presence as a leading name in the area of cam index drives, CNC rotary tables and rotary index tables. Further, our well established infrastructure facilities at Nasik & Mumbai as well as well spread marketing/ service network throughout India also support us in our aim of delivering quality end products to our customers that include major Indian industrial giants, leading machine tool builders, corporate, medium and small-scale end users. Our systems are well demanded by these clients as these provide vital assistance in substantially increasing the capability and productivity of involved CNC machining centers.